Unionville Milliken Soccer Club - Congrats to Isabelle Nashmi, UMSC’s Superstar! Congrats to Isabelle Nashmi, UMSC’s Superstar! 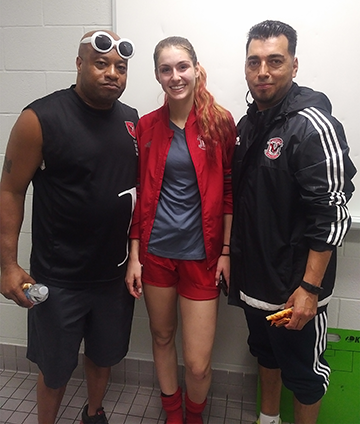 Isabelle Nashmi with long-time coaches Glen Faulknor and Alex Morales (since U7)! Congratulations to Isabelle Nashmi, member of Unionville Milliken Soccer Club’s League1 Ontario Semi Professional Team for her scholarship to Southern Methodist University! Isabelle has been with #UMSC since she was 7! Isabelle represented Canada in regional and national events. in 2016-17, she was selected to represent team Ontario in the Canada Games 2017, in addition she was selected to represent team Ontario in the Ontario vs. Quebec Games. In 2014-15, was promoted to Regional Excel (REX) Senior Team Player. In 2013-14, selected to participate fulltime in the Canadian Women's EXCEL program (REX). In 2013, selected for the U15 Provincial All Star Team in the Quebec vs. Ontario Series. In 2012, selected for the U14 Provincial Team (Traveled to France). Recognized by His Worship Mayor Frank Scarpitti, Mayor of the City of Markham, for outstanding achievement in sport at the Provincial and National level. Isabelle helped her club team win the 2015-16 OWSL League Title. Isabelle gives back to the community as a volunteer soccer coach and inspires UMSC's youngest players! We wish Isabelle all the best at #SMU, she makes us #strikerproud!